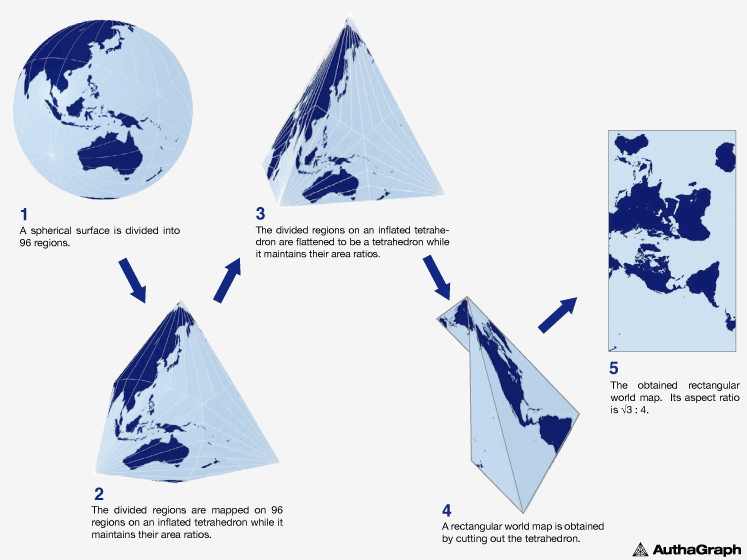 You probably don’t realize it, but virtually every world map you’ve ever seen is wrong. And while the new AuthaGraph World Map may look strange, it is in fact the most accurate map you’ve ever seen. The world maps we’re all used to operate off of the Mercator projection, a cartographic technique developed by Flemish geographer Gerardus Mercator in 1569. This imperfect technique gave us a map that was “right side up,” orderly, and useful for ship navigation — but also one that distorted both the size of many landmasses and the distances between them. Narukawa’s process indeed succeeded in creating a map that no longer shrinks Africa, enlarges Antarctica, or minimizes the vastness of the Pacific — and the list goes on. In recognition of Narukawa’s success, he’s now beaten out thousands of other contestants to receive this year’s Grand Award from Japan’s Good Design Awards, and his map is featured in textbooks for Japanese schoolchildren. Furthermore, according to Narukawa, his map means a lot more than just a faithful cartographical representation of our planet. Because Earth is now facing down issues like climate change and contentious territorial sea claims, Narukawa believes that the planet needs to look at itself in a new light — a view that perceives the interests of our planet first and its countries second. Can We Survive The Sun’s Death?